I made a slight change to this recipe originally from Cooking Light Magazine. The original recipe calls for pumpkin seeds, but I used shaved almonds instead. This is a very flavorful salad. 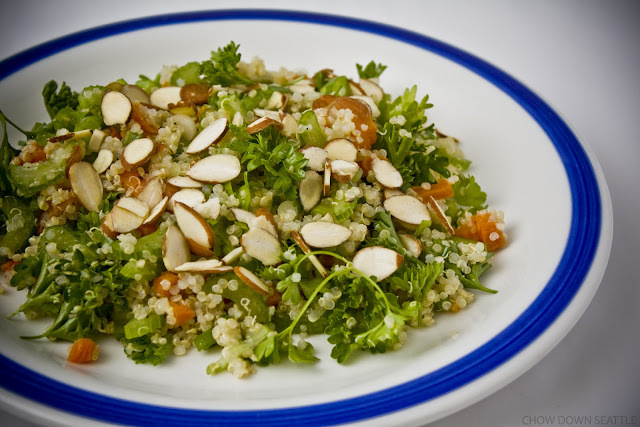 The Quinoa packs a good amount of vegetable protein. 1. Bring water and quinoa to a boil in a medium saucepan. Cover, reduce heat, and simmer 20 minutes or until liquid is absorbed. Spoon into a bowl; fluff with a fork. Add parsley, celery, onions, and apricots. 2. Whisk lemon juice, olive oil, honey, salt, and black pepper. Add to quinoa mixture, and toss well. Top with almonds.